Christopher “Harley” Larriva came to Project SEARCH from Mason County where there wasn’t a program able to meet the needs he had as a student with a disability. Harley, one of seven family members being supported on one income, travels 30 miles to get to school. He attends the Project SEARCH internship program for young adults with disabilities ran in partnership with the Olympia School District, Morningside, and The Evergreen State College. With support, Harley prepared for his first internship in the fall by filling out an application and completing an interview. After being offered the internship in food services, he obtained his food handlers permit and non-slip shoes. Harley will try 3 of over 20 individual internship site options during the Project SEARCH school year. He will work alongside college employees 16 hours a week, gaining employment skills. On Fridays, he will dress professionally and tour businesses off campus or access any resources needed to obtain independence. His future is very bright. Shimika was referred to Morningside in 2002, as part of the PACES transition program at North Thurston High School. Shimika had never held a job before, but was excited to try something new. After trying out several volunteer jobs during her senior year of High School, Shimika interviewed and was hired as a dishwasher at Traditions Cafe in downtown Olympia in 2003, where she continues to work today — an amazing 12 years later! Shimika experiences deafness but she has never let that stop her from accomplishing her vocational dreams. 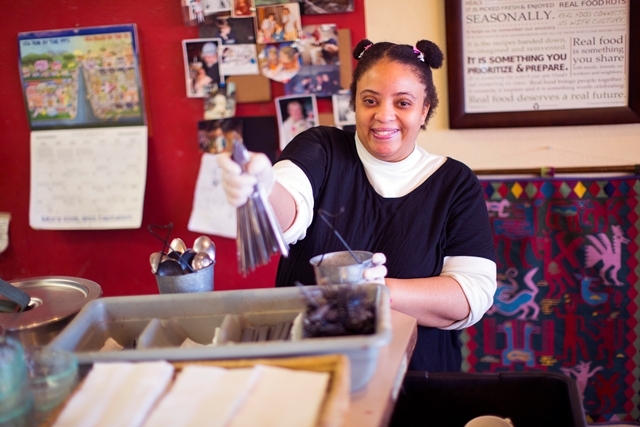 With the help of visual aids, some creative communication, and lots of practice, Shimika has been employed at Traditions as a dishwasher since 2003, where she preps the dining room and kitchen for service, cleans and stocks the restrooms, before finally washing dishes for breakfast and lunch services. Shimika’s can-do attitude and determination to never give up is one of her greatest qualities, making her a valued team member at Traditions. Shimika has adapted by learning to communicate through lip reading and gesturing with her coworkers and managers. Shimika has even helped her job coach learn the ASL alphabet so that Shimika can communicate in her own language. 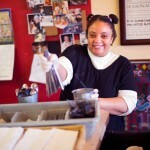 Traditions Cafe owner Jody has remarked, “Shimika is someone who brings joy to the work place.” One of Shimika’s best traits are being so hard-working and dependable, reports Judy. Shimika has a great sense of pride working at Traditions, and hasn’t missed a day of work in over a year! Shimika has reported her favorite thing about working at Traditions are her co-workers, many of whom have worked with Shimika since she was first hired, who give Shimika a sense of belonging by treating her as a valued member of the Traditions team! For more client or business success stories, please visit our YouTube Channel.